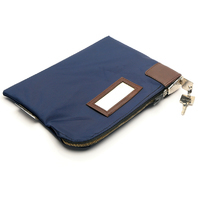 The Honeywell 6505 key locking zipper deposit bag is a great way to keep small objects secure when on the go. This blue zipper bag includes a key Lock with 2 entry keys, a plastic id card window located on the front, and a card Stock id card for labeling purposes. The Honeywell 6505 is backed by a 1 year limited warranty.